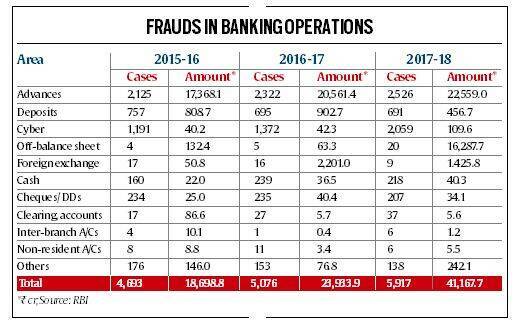 There were 5,917 instances of bank fraud in 2017-18 as against 5,076 cases the previous year, show the data released Friday. The instances of fraud have been rising over the last four years — by four times from Rs 10,170 crore in 2013-14. Fraudsters have looted Rs 41,167.7 crore from the banking system in 2017-18, a sharp jump of 72 per cent from Rs 23,933 crore the previous year, despite “stringent monitoring and vigilance”, according to data released by the Reserve Bank of India (RBI). There were 5,917 instances of bank fraud in 2017-18 as against 5,076 cases the previous year, show the data released Friday. The instances of fraud have been rising over the last four years — by four times from Rs 10,170 crore in 2013-14. In 2017-18, however, frauds related to off-balance sheet operations, foreign exchange transactions, deposit accounts and cyber-activity took centrestage. Banks reported more cyber frauds during the year, losing Rs 109.6 crore in 2,059 cases in 2017-18 as against Rs 42.3 crore with 1,372 cases the previous year. Large-value frauds involving Rs 50 crore and above constituted about 80 per cent of all the frauds reported this year. Significantly, 93 per cent of fraud cases worth more than Rs 1 lakh occurred in PSU banks while private banks accounted for six per cent. The increasing number of frauds has contributed to the ballooning bad loans, which were at Rs 10,39,700 crore as of March 2018. The jump in 2017-18 was primarily due to the over Rs 13,000-crore Punjab National Bank (PNB) case, involving fugitive businessmen Nirav Modi and Mehul Choksi. “In terms of amount, frauds in the banking sector increased sharply in 2017-18, mainly reflecting a large value case in the jewellery sector,” the RBI said. The central bank has admitted that “frauds have emerged as the most serious concern in the management of operational risk, with 90 per cent of them located in the credit portfolio of banks”. According to the central bank, the modus operandi of large-value frauds involves opening current accounts outside the lending consortium without a no-objection certificate from lenders, deficient and fraudulent services/ certification by third-party entities, diversion of funds by borrowers through various means, including through associated/ shell companies, lapses in credit underwriting standards and failure to identify early warning signals. In February 2018, the RBI advised the Indian Banks Association (IBA) to initiate action to put in place enhanced IT-enabled, user-friendly, web-based TPE reporting and disseminating infrastructure with suitable data security and control measures. Moreover, in view of the cases relating to the Society for Worldwide Interbank Financial Telecommunication (SWIFT) system, including the PNB case, the RBI directed banks to strengthen various operational controls in a time-bound manner. An expert committee, headed by Y H Malegam, was formed in February 2018 to examine asset classification and provisioning practices of banks and the incidence of frauds. RBI guidelines require banks to report the names of third-party entities like advocates, chartered accountants, valuers and architects involved in bank frauds to the IBA, which disseminates caution lists to banks.